Who says fascism is out of style? Evidently the FEC is making it chic again. The Chairman of the Federal Election Commission berated Democratic colleagues who imposed rules on the publisher of Rep. Paul Ryan’s new book, The Way Forward. In essence, they opened the door to future book regulations or even the banning of books. The meeting got heated to say the least and in the end, the FEC declined to definitively spare book publishers from the reach of campaign finance rules. Stoke the fires boys! 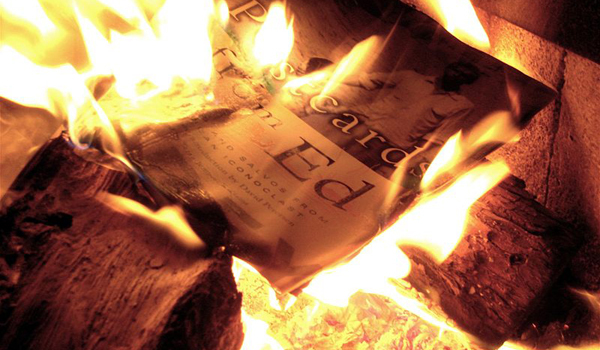 We’ve got some book burnin’ to do!!! “That is a shame. … We have wounded the free-press clause of the First Amendment,” Goodman told FoxNews.com after the tense meeting. Goodman previously has warned that the commission wants to start regulating media. “By failing to affirm this publisher’s constitutional right, statutory right, to disseminate a political book free from FEC conditions and regulations, we have effectively asserted regulatory jurisdiction over a book publisher,” warned Chairman Lee E. Goodman, one of three Republicans on the six-person FEC. “That failure reveals a festering legal uncertainty and chill for the free press rights of books and book publishers to publish and disseminate political books free from government regulation,” he added. Of course, immediately following this truthful assessment, Democratic Commissioner Ellen L. Weintraub started screaming: “Liar, liar, pants on fire!” Or something to that effect as she categorically stated, “No one is banning books.” Which just verifies that is indeed what they intend to do. Right is wrong, up is down – it is the Progressive/Marxist way. The Democrats were insulted that someone would dare speak the truth and petulantly refused to attend subsequent meetings. They either get their tyrannical way or they throw a tantrum. How fitting for a bunch of infantile despots. 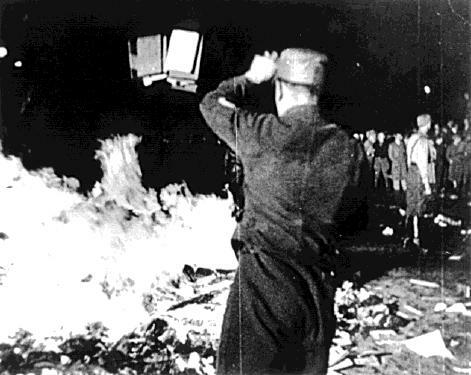 Book burning in Berlin, May 1933. Goodman and the other two Republicans on the commission of six, issued a six-page critique of the commission’s vote on the Ryan book. The vote imposed constraints on the publisher and on how Ryan’s re-election campaign and leadership political action committee, Prosperity Action, can promote the book on websites. Next step, actually controlling and monitoring web sites as well. Democrats on the commission have been chipping away at conservative rights everywhere and whenever they can, while Republicans have been working to protect rights. Even rights that extend to those such as George Soros. Goodman has been ringing the alarm bells that conservative news sites such as the Drudge Report may face regulations as the Democrats work to stifle free speech with the “media exemption” – which defines who the press really is and who gets to report what. That, my friends, is the heart of fascism. It basically does away with your First Amendment rights, just as Ted Cruz has pointed out repeatedly. I’m no fan of Paul Ryan’s, but no one should have the authority or power to say what you can write, how you promote it or what you can say. Unless of course you are a Leftist politician who doesn’t give a rip about the Constitution. Examples of books burned by the Nazis on display at Yad Vashem. In the case of the Ryan book, publisher Grand Central Publishing sought the broad media exemption from regulation, but Democrats rejected that and pushed for a different, commercial, exemption that imposes rules over the publisher’s politics and book pricing. Republicans went along and the commission approved that 6-0. The commission also ruled that while Ryan can have his campaign and PAC buy books to give out, the promotion on his websites has to be limited to two sentences. There were concerns raised by Weintraub that Ryan was trying to profit off sales of the book promoted on his websites. Republicans carried that to victory in a 4-2 vote. Goodman said the mixed decision for Ryan was another missed chance by the FEC to publicly show support for press freedom. “This commission should stand up and recognize that books qualify for the media exemption and that book publishers can publish, market and disseminate their books on the same basis that the Washington Post, New York Times and Washington Examiner can,” he said. The least that Paul Ryan’s people could have done was show they have some spine, but no… don’t want to ruffle Progressive feathers, do we? “By failing to affirm this publisher’s constitutional right, statutory right, to disseminate a political book free from FEC conditions and regulations, we have effectively asserted regulatory jurisdiction over a book publisher,” Goodman asserted. “That failure,” he concluded in a blistering dissent, “reveals a festering legal uncertainty and chill for the free press rights of books and book publishers to publish and disseminate political books free from government regulation. If Ryan thinks he can garner votes by playing both sides of the fence by being diplomatic here, he is delusional. At this rate, elections won’t mean spit by 2016. He won’t have to worry about getting elected, he’ll have to worry about which gulag to decorate. Perhaps Paul Ryan should change the title of his book to “the way backwards….way, way backwards”. Wordpress have some I can’t remember where I saw those websites. So sorry do try google. Best way to preserve books are to put collection of books written truth into plastic boxes and bury under soils.